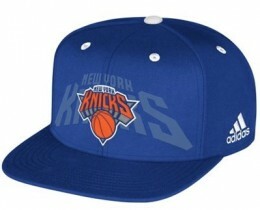 With the spotlight of New York City firmly on them, the New York Knicks are a hotbed for fans, collectors and the media. Given that the Knicks have not won an NBA title since 1973, the pressure continues to mount. Nevertheless, the team enjoys a strong fan base that stretches far from the boroughs of NYC. 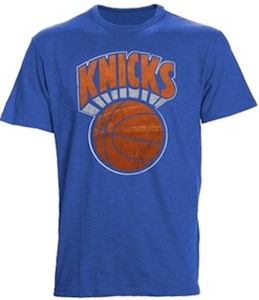 The following guide offers a detailed list of helpful suggestions when gift shopping for a fan or collector of the New York Knicks. 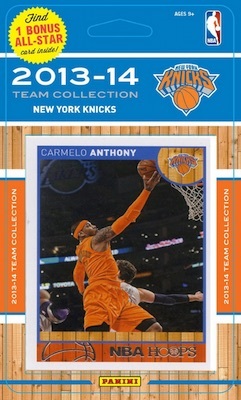 Collectors looking for more information about the team should out our comprehensive New York Knicks Collecting Guide. 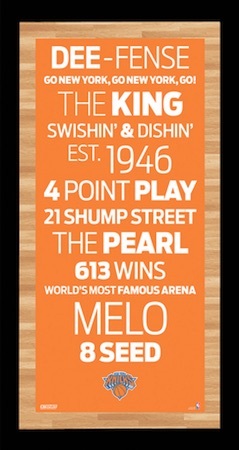 The list below features 20 different gift ideas that are catered to fans and collectors of the Knicks. Specific gifts along with more broad suggestions are both included and a variety of price points insures that most budgets are covered. 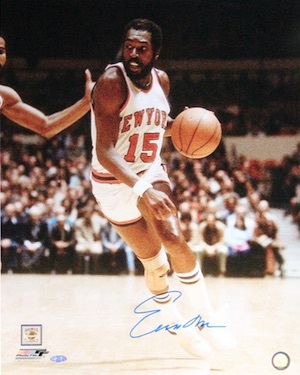 After starting his career with the Baltimore Bullets, Earl "The Pearl" Monroe joined the Knicks for the remainder of his NBA playing days. The Hall of Fame guard was instrumental to the 1973 title run and paired with Walt Frazier to form an impressive backcourt. Signed photos for "The Pearl" make an excellent gift option for a fan. Willis Reed was part of both titles teams for the Knicks, winning the Finals MVP award in 1970 and 1973. 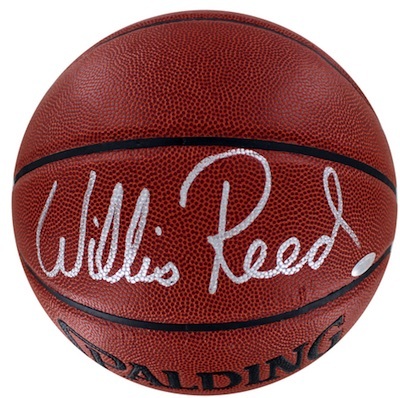 Reed spent his entire Hall of Fame career with the Knicks and his signed memorabilia remains popular with fans and collectors. An autographed basketball offers a nice display piece for a man cave. 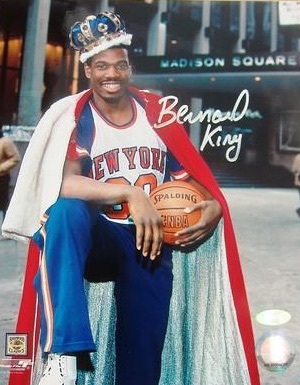 Bernard King played for six teams in his career but had some of his best years with the Knicks. The Hall of Fame small forward was a prolific scorer and is remembered fondly by fans of the team. Signed photos can be found for budget prices and his name allows for fun photo shoots like the one shown below. 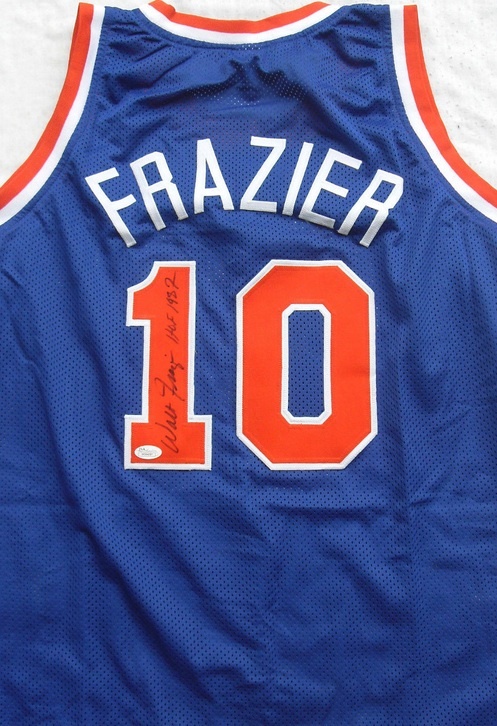 Also present for both of the team's titles, Walt Frazier was the point guard for the team during much of the 1970s. Signed jerseys for the Hall of Fame player are a great premium item. Even though he never brought a title to New York, Patrick Ewing remains the biggest name in the franchise's history. 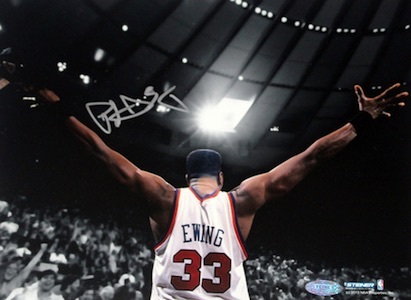 Understandably, Ewing's signed gear is one of the top options for fans and collectors. While prices are not cheap, signed photos present a less expensive option for the Hall of Fame center. Another name from the title years, Dave DeBusschere was originally with the Detroit Pistons before a trade sent him to New York. The Hall of Fame forward was a a terror on defense and his death in 2003 means there are not many autograph options and those that exist carry a premium. 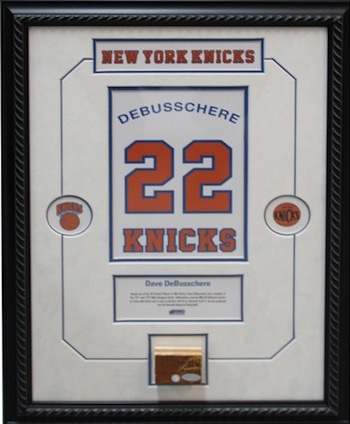 This framed collage for DeBusschere is a great alternative option for a fan or collector. 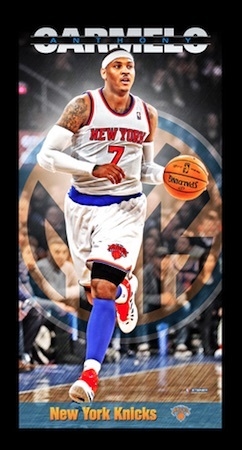 View more collage options for the Knicks here. The current superstar on the team, fans and collectors hope that Carmelo Anthony can bring the team back to greatness, but time is running out. Signed gear carries a premium but the framed image below offers an appealing budget option that would work great in a bedroom or man cave. 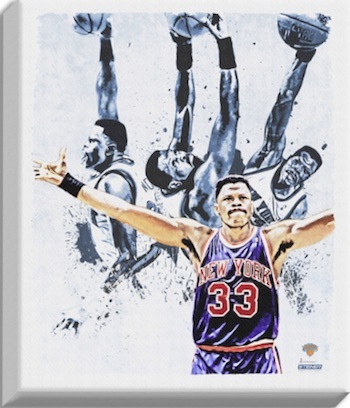 A vivd and artistic canvas print can really class up a space and for a fan of the Knicks, Patrick Ewing is one of the ideal choices. This impressive prints comes in multiple sizes and would look great signed. The storied Knicks' franchise is perfectly encapsulated on this framed subway sign, with notable moments and players highlighted. Several different sizes are available and there are also combo packages that pair the sign with an autographed basketball. 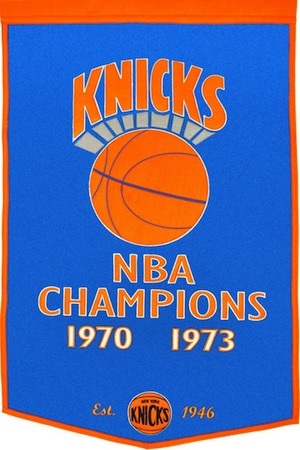 While fans wish it was more filled in with title years, this wool banner for the Knicks features a quality look and would work well in a man cave or bedroom. 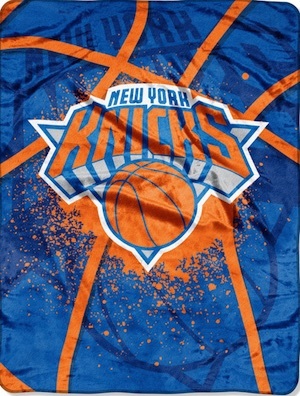 The bold look and bright team colors make this Knicks blanket a fun budget gift that can also be quite useful in the winter months. 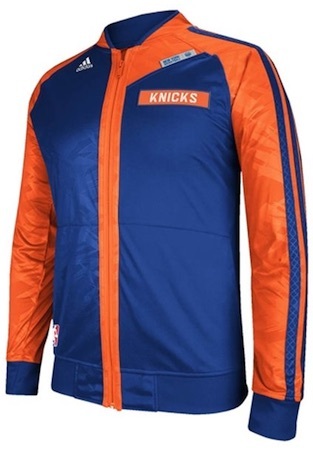 Another budget gift with a bold design, this Knicks basketball would work well on its own or could easily be paired with the blanket for a team combo gift. Basketball cards are a popular option for fans, but they are not as simple to buy because they are so specific. 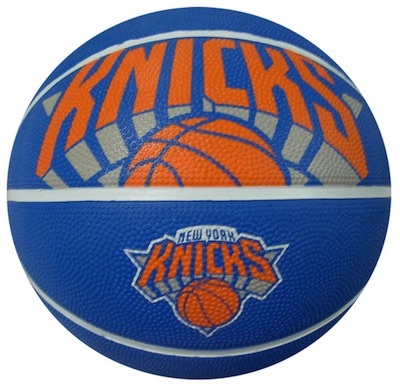 One option we recommend for budget gifts or stocking stuffers is New York Knicks team sets. Some are sealed and some are hand-collated, but the result is the same. Make sure to verify the year of the card and the players included to make sure you are getting what you expect. 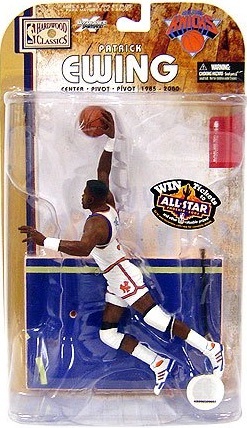 Whether shopping for a child or an adult, New York Knicks figures and bobbleheads can be a great gift. Several different brands offer a variety of options and many players can be found from the history of the franchise. Check out specific figures on eBay using the links below. 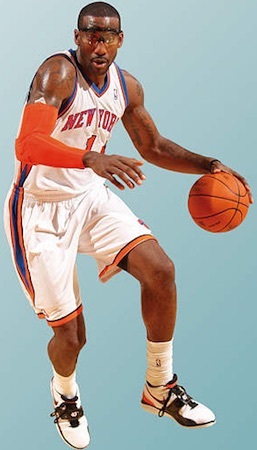 There are a good variety of different New York Knicks team fatheads. In addition to team logo versions, players are some of the top Fatheads and three of the most popular Knicks are noted below. 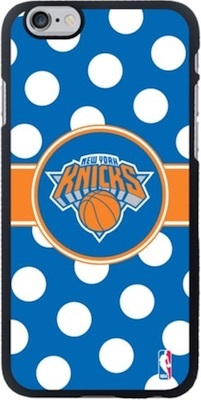 Smartphones are the new norm and can make for an easy and inexpensive gift for a New York Knicks fan. Just make sure to verify the exact make and model before you buy. We have included direct links to Amazon below for the most popular phone models. 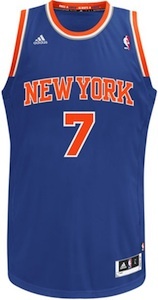 Jerseys remain the most common way for fans to display their love of the Knicks. Replica versions offer cheaper prices and fans can also have them customized for added appeal. If you are overwhelmed by the many versions, check our detailed NBA jersey guide here.